Once at the Chemainus Theatre Festival. A review. You are here: Home / Arts / Once at the Chemainus Theatre Festival. A review. Once (currently at the Chemainus Theatre Festival to March 10) is a breath of fresh air in the world of the contemporary musical. Once had an unusual progression to the stage, and a backstory to rival the script—originally conceived by John Carney as a low-budget Irish film, songwriters Glen Hansard (frontman of The Flames, an indie rock group of some repute) and Markéta Irglová (a young Czech musician who was only 17 at the time) were originally tapped for the film’s music and ended up playing leads. Falling Slowly went on to win Best Original Song at the 2008 Oscars. The script for the musical (which debuted on Broadway in 2012 and in Toronto in 2015) was written by famed Irish playwright Enda Walsh. For the Chemainus Theatre, director Peter Jorgensen (also the show’s choreographer) has assembled a talented and energetic quadruple threat cast, including singer/songwriter Daniel Kosub (Guy) who audiences will remember from Million Dollar Quartet (2016) and Stephanie Cadman (Réza) who was part of the Dora-winning Toronto production of Once. Kosub is a perfect choice for this role—a graduate of the Canadian College of Performing Arts, music is in his bones—in the last decade he’s toured “relentlessly” and recorded four albums with the last, Rocks and Gravel, being self-produced in his new home studio. To say he understands the soul’s need for music, and the vicissitudes of the business, would be an understatement. As Guy he is suitably scruffy, slightly scuffed around the edges, and incredibly weary of the incessant chase at success—so much so he’s prepared to abandon it all, to the great dismay of Girl (played by Allison Lynch as a fiery wisp with steely inner determination and a no-nonsense drive to get things done). Their chance encounter, just as Guy is about to give it all up, sets off a cavalcade of events. In swift order the audience is introduced to Billy (Mark Weatherley) the grumpy shopkeeper who lets Girl play the piano for free since she can’t afford an instrument, Guy’s “Da” (also Weatherley), his enigmatic Ex-Girlfriend (Masae Day), the dour Bank Manager (Jon-Alex MacFarlane), Eamon (Kraig Wraye) and the Girl’s housemates—her mother Baruska (Alison Jenkins), the sultry Réza, Andrej (David Cohen) who works in a fast food joint and dreams of being manager, and Svec (Alexander Nicoll)—a group of Czech immigrés who learn English by watching (and passionately discussing) TV soap operas. Throughout there is a sense (amply underscored by the music) of yearning, of unrealized hopes and dreams, and, to some extent, of displacement—Guy is separated from Ex-Girlfriend in New York, Girl’s husband has gone back to the Czech Republic, her housemates want desperately to fit in to Irish society, the Bank Manager is a closeted musician, Da is mourning the death of his wife. Through their collective melancholy, this disparate group of individuals unites to accomplish the seemingly impossible—fund and record a hit album in 24 hours. Ireland seeps into every corner of the production—from set designer Lauchlin Johnston’s richly re-created pub (serving real drinks before the show) with its stone-hewed walls, upper balcony and set décor studded with utensils, musical instruments, suitcases and sports gear, to Craig Alfredson’s sensational light and projection design filled with muted shadow and dimmed tones, to costume designer Jessica Oostergo’s modern garb—and is nowhere more evident than in the music (musical director Kraig Wraye) and dance, be it spirited high-step and tap or slow simple rotations of multiple musicians as the ensemble backs the principals. It’s easy to imagine being swept away to the Emerald Isle. Tension builds slowly; Once is far from being a standard romantic musical—many of the songs are written in a minor key, furthering the sense of mournfulness and absence. Leave, the opening number, sung by Kosub, is a wail of unrequited love for a departed ex-girlfriend, Falling Slowly a slow heartfelt ballad between Kosub and Lynch, The North Strand a riot of jig with fiddle, bass, accordion and beats, while Ej, Pada, Pada, Rosicka injects cheery up tempo Slavic rhythms, and Abandoned in Bandon, the Bank Manager’s bad country song provides much comedic relief (MacFarlane is terrifically cheesy in this number). In Gold every important word is carefully weighed and underscored. The ensemble, ten in all, melds sound, lyrics and instruments to produce an exemplary live musical experience that is note-perfect. Rather than reducing the story line to a well-known trope Once reserves surprises with its restrained and ambiguous ending, in a departure from standard fare—it’s part of the sweet realistic charm that has endeared audiences to both the film and the musical, making them both resounding hits. Uplifting, filled with strong performances, memorable music and a beguiling esthetic, Once is a brilliant beginning to a new season for the Chemainus Theatre Festival, one that is sure to attract the young and the young at heart. Guy meets Girl and they make beautiful music together in this unconventional yet wise and intensely moving tale of passion and hope. Busking on the streets for cash and working in his father’s vacuum repair shop, Guy is a heartbroken musician who has given up on his passion and creative aspirations. Girl is an immigrant with a generous heart and a complicated history. They are as different as two people can be, but their stubborn compassion and love for creating inspiring music bring them together. In this emotionally captivating story, Guy and Girl will make you will laugh, move you to tears, and share with you the universal feeling of joy which comes of joining together in song. 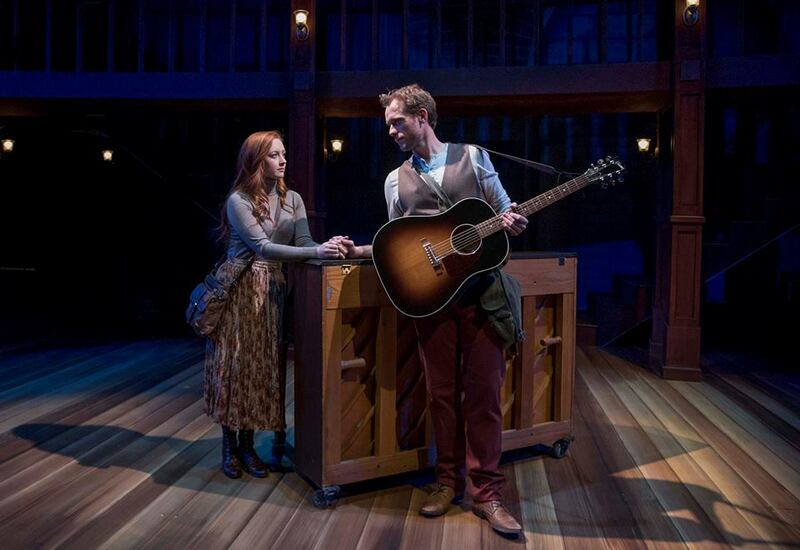 Once is a truly original modern musical which reminds us there are as many ways to love as there are songs to sing. Disclaimer: We attended Once as guests of the Chemainus Theatre Festival and the Playbill Restaurant. Footloose The Musical at the Chemainus Theatre Festival. A review. The Cornwalls’ All-Inclusive Cancun Christmas at the Chemainus Theatre Festival. A review. After seeing the production feature on the Tony awards, and that year travelling to NYC, I HAD to see Once and indeed saw it in September that year after its Tony sweep. The Juxtoposition to Once was seeing The Book of Mormon. Yes, Once AND The Book of Mormon back to back. Once was beautiful and inspiring and evoked emotions. The production I attended today at Chemainus (Sat. Feb 17) took me back to all the feelings I felt on Broadway seeing Once. Perfectly cast. Gorgeous music, voices, instruments. Thank you for your incredibly honest and touching production. it’s a wonderful production. Thanks for your comments which I have passed on to the theatre.